This week's Tavern Brawl has introduced co-op play to Hearthstone for the first time and the result is something staggeringly different. Shacknews offers some first impressions, while also speculating on what this could mean for Hearthstone at this year's Blizzcon. For this week's Tavern Brawl, Blizzard had a little something different for Hearthstone players. This week's Brawl is "Unite Against Mechazod," in which two players join forces against the mechanical menace Mechazod. It marks the first instance of co-op play into Hearthstone, possibly heralding something much bigger from this weekend's Blizzcon. After trying it out, it's safe to say that this completely changes a number of the game's elements. 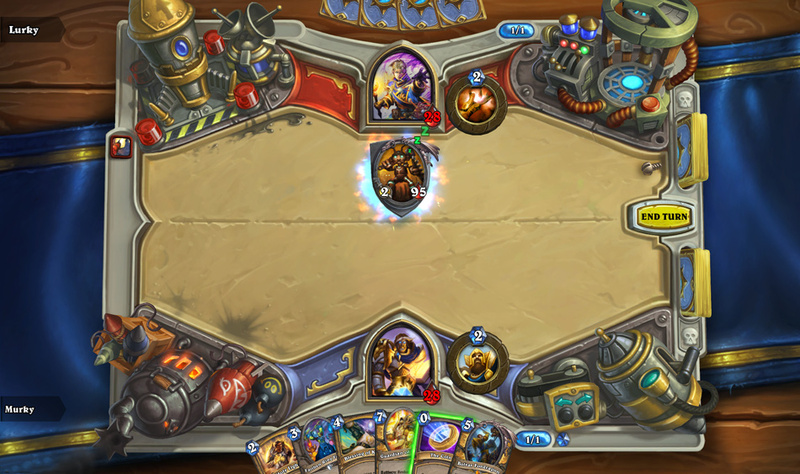 Two players (Paladin and Priest) go in with pre-built decks against one foe. Mechazod will take the board with 2/95 stats and Taunt, but he will gradually grow more powerful as the game goes along. Depending on which player's turn it is, he'll take his position on the opposite side of the board. This means players must be careful, making sure they don't inadvertantly wipe out their teammates' minions in an effort to hurt the boss. What's wild about this particular Tavern Brawl is that it makes players completely rethink card strategies and changes the perception of what's useful. Cards that were previously thought to have major drawbacks suddenly become immensely useful in this mode and actually utilize teamwork. Cards like Refreshment Vendor will restore health to both players, while Arcane Golem gets the double benefit of Charge and giving your teammate a free Mana Crystal. Even cards thought to be entirely useless have found a new lease on life. Long thought to be the most useless minion in the game, nobody's laughing at Millhouse Manastorm anymore, since his effect gives a teammate free spells for the entire next turn. Everything's coming up Millhouse! Even with all of that synergy in mind, Mechazod is hard! Boosting minions can backfire, since he has a seemingly endless supply of Assassinate spells, while his Overclock ability means that charging for the face will almost surely mean instant doom for one unfortunate minion. You can see this writer's first attempt in the video below. It did not go well. So that now raises the question: What is this Tavern Brawl leading to? The most logical answer would be a co-op campaign of some sort, in which players must team up against a variety of Hearthstone bosses. While editor-in-chief Steve Watts is already pointing to the trolling potential embedded in this mode, if players go in with the common goal of earning new cards, it should ensure a degree of cooperation. It should also introduce some interesting new deck combiations, as it's now clear that competitive and co-op decks will need to look vastly different. It'll be especially interesting if the campaign allows Battle.net friends to join forces, as opposed to this Tavern Brawl that pairs random players together. Come back this weekend for Blizzcon, where we'll all find out if this Tavern Brawl is leading to anything greater. If not, best of luck against Mechazod. You're going to need it.